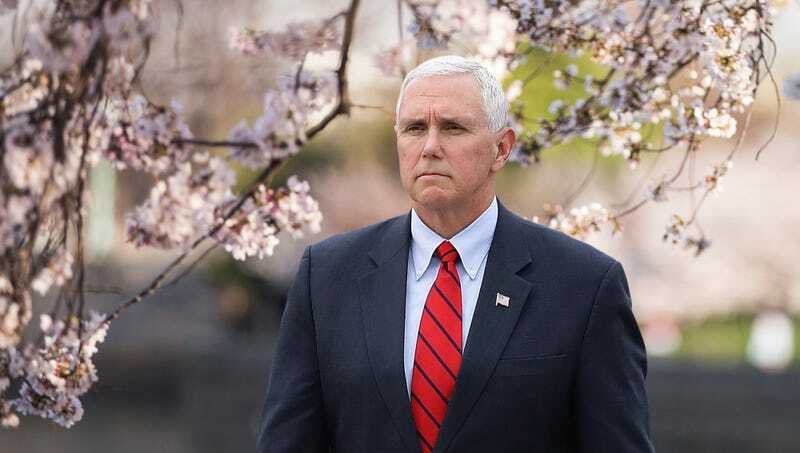 WASHINGTON—Expressing outrage at the crude, depraved perennials throughout the nation’s capitol, Vice President Mike Pence was reportedly horrified Tuesday by the D.C. cherry trees flagrantly displaying their reproductive organs for all to see. “Oh, no, this is completely disgusting,” said a visibly agitated Pence, who rushed around urging nearby pedestrians to keep their heads bowed so as to avoid catching a glimpse of the exhibitionistic flora. “How are we supposed to get anything done with these perverted saplings waving their stamens around without any regard for decency? I understand that these trees need to reproduce, but it should be a private matter between a plant and its pollinator, not something that good, upstanding D.C. residents should be forced to endure. I’m afraid to say that these sick, pornographic displays in areas frequented by women and children serve as yet another troubling example of our country turning away from traditional family values.” At press time, Pence was reportedly comforted by the knowledge that before long, his administration’s environmental policies would put a stop to these trees’ licentious behavior.